Barcelona director Raul Sanllehi has taken time out of his hectic schedule to reveal to the waking world that the Catalan club currently have no plans to launch another bid for Arsenal captain Cesc Fabregas – isn’t that good of him? Incidentally, the two clubs are set to meet in the Champions League next week, but it would surely be over-cynical to suggest that that would have had any bearing on the timing of Señor Sanllehi’s non-statement. Thankfully, it’s nigh-on impossible to be bored by Barca’s incessent haranguing of Fabregas, or we’d all be driven to distraction by it by now. rough translation: we already have enough small, sleek midfield coupes and we don’t really have the cash anyway. If Andy Carroll went for 35 Million Pounds, Cesc is gonna cost more than 45 million euros, particularly with 4 years left on his deal. Well of course the deal is dead for now…it’s February. I’m sure the press will ensure it’s back on for around June though! They only need Cesc when Xavi retires. Might aswell let him keep playing for Arsenal for a few years rather than letting him stagnate on the Barca bench. Three, maybe four, years down the line is when they should make their move. I doubt they will though. This saga is fukkkkking boring me to tears now. Who gives a fukk. Barca have a class team and he is not good enough to push Xavi ort iniesta out of the team. 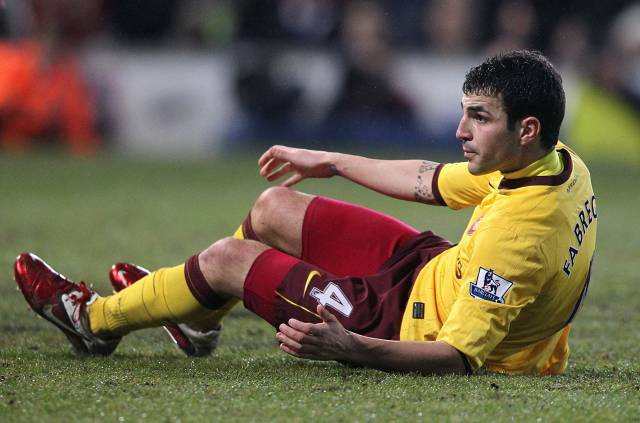 On another note, if Carroll is worth 35 million Fabregas must be worth about 80 million, Definitely. What is in every one’s mind is that Fabregas will be sooner than later in camp nou.they will need him as a cover if any of the two playmakers gets injured. bet me if it won’t happen. 1. It’s February. Of course the deal’s dead. Basically, he shouldn’t leave. Period.